When the NFL planned its operations for Super Bowl 2012, social media was front and center. They built a huge social media control center, including 150 ft2 of networked screens, where fifty experts logged 15-hour days for two full weeks. They monitored social media networks, racking up 64 million mentions, and impressively responding to most of them in just minutes. The NFL estimates that the effort earned $3.2 million in positive press and a 12.5% boost in consumer sentiment (source). Widespread adoption of social media has forced companies to manage their brand in an entirely new way. As consumers have an ever-growing sounding board for their dissatisfaction with a brand, proactively promoting and managing a brand is no longer enough on social media; the brand must now treat social media as another customer service channel and manage it as such. Doing so allows for quick and effective response to negative brand impressions. Not only does this minimize damage, but it can also turn brand detractors into promoters. While most would agree that satisfying your customers is crucial to a company’s success, the magnitude of unresolved customer service needs to be understood: 17% of customers will leave a brand after a single incident, 40% more will leave after a second incident, and 28% more after a third mistake. Combine those and 85% of a brand’s customers will switch to a competitor after only 3 mistakes. Bad service leads to poor loyalty, which negatively impacts sales. More than 80% of surveyed consumers say they have abandoned a purchase because of a poor service experience (source). Despite a company’s best efforts, poor service experience is inevitable, but how the company responds can make all the difference. Service recovery is a key skill for the company and begins with first being aware of the customer’s dissatisfaction. Once aware, the company must have empowered employee(s) who can work with the customer to ask questions, get to the heart of the matter, and be in a position to resolve the matter. One new way to deliver this customer service is through the monitoring of social media. Odds are that if you’ve made your way to this blog, you are already familiar with social media, but let’s do a level set. Social media refers to technologies that allow for people and companies to share text, images, audio, and video content with other users. It primarily consists of social networks (such asFacebook, Twitter, Google+, and LinkedIn) as well as others. Social media also includes online communities such as discussion boards and forums where people come together to publically discuss topics of interest, which can be indexed by online search engines such as Google or Bing, enabling other users to find relevant conversations. When it comes to which social media networks companies choose to leverage, of the Fortune 500 companies, 73% have active Twitter accounts and 66% have active Facebook pages. The use of blogs remains relatively low at only 28% (source). To put the scale in scope, the table below shows the number of followers and fans for some of the biggest brands. 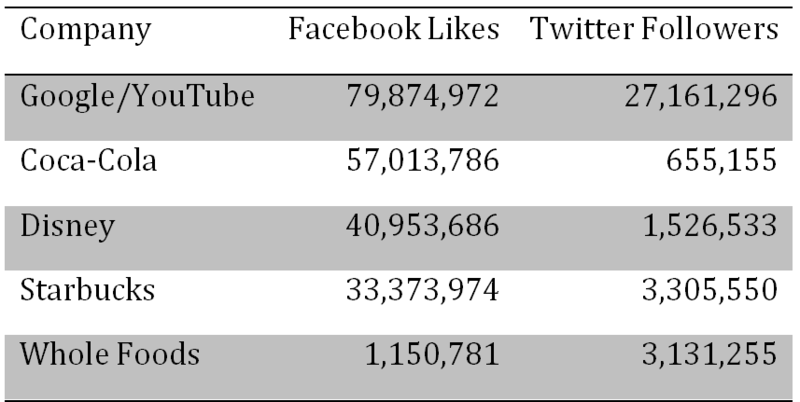 It is important to note that many of these brands have multiple Twitter and Facebook pages, but the table only shows their primary accounts (thus their total influence is even greater). The consumer’s power to shape a company’s brand continues to increase as social networks grow. This is due to the network effect, which describes how the value of a service increases as the number of people using that service increases. This concept is best captured by Metcalfe’s law, developed by Bob Metcalf in the 1980s, which explains that despite the linear cost to deploy a local area network (LAN), the value realized by the users is exponential (source: Hendler, J., & Golbeck, J. (2007). Metcalfe’s law, Web 2.0, and the Semantic Web. Journal of Web Semantics , 6.). This law has been found applicable to the growth of telephones, mobile phones, faxes, email, video conferencing, and most recently, social media networks such as Twitter and Facebook. In short, the more people who have access to the same technology as you, the more value you will receive from that technology. While the value of utilizing social media channels can be hard to calculate, a report from McKinsey Global shows that 4,200 companies stand to see a sum of $900 billion to $13 trillion of value unlocked (source). The report continues that two-thirds of the estimated value comes from “improved communications and collaboration within and across enterprises.” This estimate is large enough to justify companies engaging in social media even without direct business cases. There is extensive literature on how best to manage social media return on investment, but I won’t be covering that here. In a 2011 study by DMG Consulting of 132 operations, two-thirds were already utilizing social media channels for at least one form of interaction (source). Of the respondents, 76% used it for marketing as it allows for both deeper and broader engagement with the brand than any other medium. 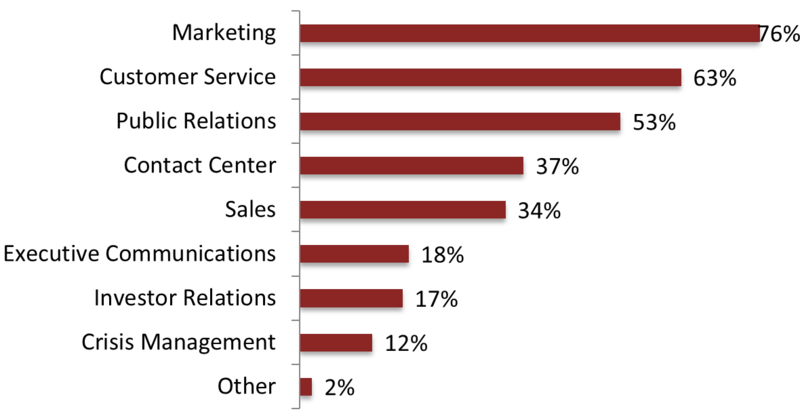 Marketers utilize social media for advertising as well as listening to their customers. When properly leveraged, these channels can help get the brand message to the customer as well as encourage buzz which further helps to spread the message. In fact, research shows that 90% of consumers trust their friends’ recommendations for product over brand loyalty (source: Shahim, B. (2011, April/May). How Social Media has Shared the way Brands Speak to Consumers. Journal of Marketing). Thus, branding pushed by the marketing department has less and less impact as consumers are more and more able to easily share their opinions with one another. Consumers see value in social media, and thus the brand needs to participate and influence those networked conversations. 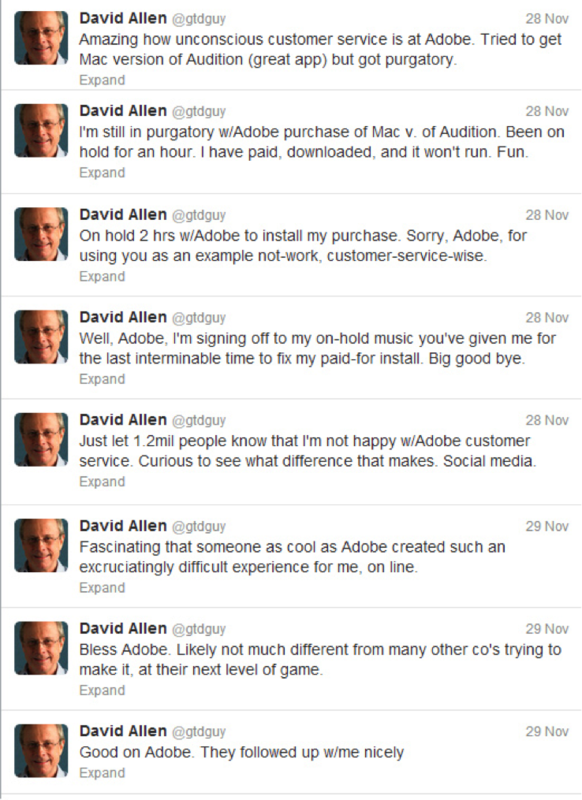 On November 28th David Allen, the author of Getting Things Done, had a poor experience withAdobe support. After not receiving satisfactory service, he tweeted to his 1.2 million followers about his poor experience 7 times, eventually questioning the overall brand of Adobe. Within a day, he heard back from Adobe and his issue was resolved, but for 24 hours, 1.2 million people heard a trusted person badmouth Adobe. Not a good day for the brand. As David’s example above shows, social media networks are enabling customers to act bigger, engage faster, and be better organized. For decades, consumers have run into problems with purchased products or services from companies. In the past, complaining to a company took some time and thought. First there was complaining in person, then by letter, and with the option of the telephone, these complaints turned to call centers. As the Internet grew in popularity, call centers became contact centers with the addition of e-mail and chat channels of communication. As new forms of communication are developed and adopted, consumers use them to complain to companies. Customers want to engage with brands on their terms; their channels. They do not think in terms of discreet channels when interacting with companies. 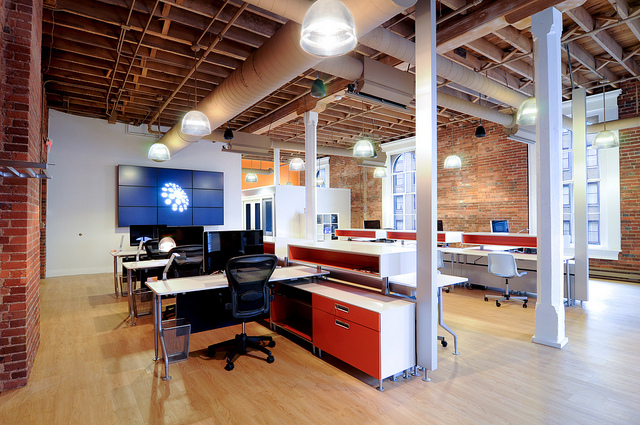 They make no delineation between contacting the company via phone, email, chat, or social. They likely do not even differentiate between sales, support, or marketing; they simply see the larger brand. People prefer sharing their frustration with the online network rather than going directly to a company. They may believe that the company is more likely to respond to a complaint once it is in the public domain, and if so, those companies need to consider this as a failure of their non-social-media support channels. The network effect increases the downside of getting service wrong and the upside of getting it right. When service is delivered well, social media users will herald it; and when the service is poor, they will do the same. Additionally, companies need to understand that social media is much more than just a marketing vehicle. Of the actionable tweets and posts a company receives, 80% are related to service, with only 20% being about marketing (source). While sales and marketing have been the promise of social media, service is the actual delivery. According to Gartner Inc., by 2014, organizations that ignore their customers on social media will have the same negative perceptions companies experience today when they ignore customer’s minimal expectations of support via email and phone. In fact, not only are 25% of customers likely to share a postivie experience, but 65% will share a negative one (source). Furthermore, responding to questions about products through social media will become table stakes for marketing departments. According to Carole Rozwell of Gartner, the failure of a company to respond to a social media user can lead to a 15% increase in the brand’s churn rate (source). This gives further evidence that companies must put a social media monitoring program in place or risk financial losses. While social networks may not be as real-time as a voice call, users do expect a relatively quick response. Laura Bassett, Marketing Director at Avaya says that “Twitter users expect a response within 5 minutes when complaining about a brand”. While most companies won’t be able to manage a response time like that, they are aware of the need to be timely. In a recent study where researchers tested response times, Zappos proved the speediest, posting an average response time of 54 minutes. The next closest companies were Best Buy (1:47), Overstock (1:53), Dell.com (2:28), and L.L. Bean (3:55) (source). Zappos’ quality of service provides them so much positive word-of-mouth buzz that they spend significantly less on marketing than their rival retailers. This is a good example of how an investment made in the customer service department can deliver significant value for the marketing department. Many individuals, mostly celebrities, have put this network effect into action, with the number one Twitter account, belonging to performing artist Lady Gaga (3.5 million followers.) In fact, 84 of the top 100 Twitter accounts belong to individual people (source). What these individuals say about a company in social media can have a greater impact on the brand than what the company says about itself. A single negative comment on a product or service by one of these influencers can result in significant impact to the brand. The earlier example of David Allen shows this as does an incident that my favorite movie director, Kevin Smith, had with Southwest Airlines. 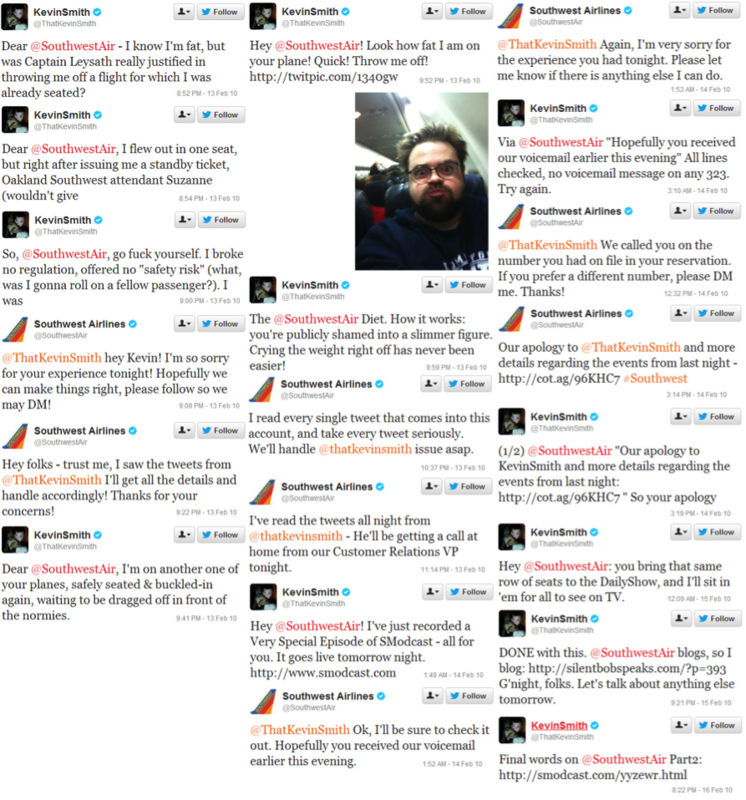 Mr. Smith had a problem with Southwest Airlines in February of 2010, he took to his Twitter account and its 1.6 million followers at the time (see image of all 20 tweets here). Within sixteen minutes, Southwest had replied, and while that speed helped, the public relation crisis had already begun. Most of the back and forth was over within two days, but it was picked up by national press as well as a strong following in social media (including over 15,000 tweets). Kevin himself tweeted eleven times, each going to his 1.6 million followers and then being retweeted many more times. After 5 days, the crisis was completely over. 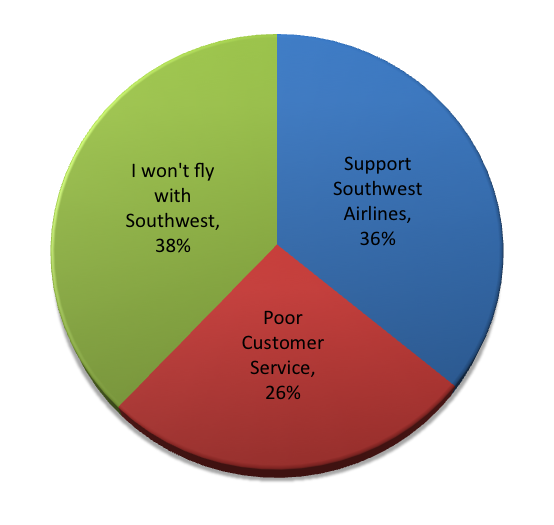 Southwest’s brand took a hit as two-thirds of the comments on Twitter were negative towards Southwest. 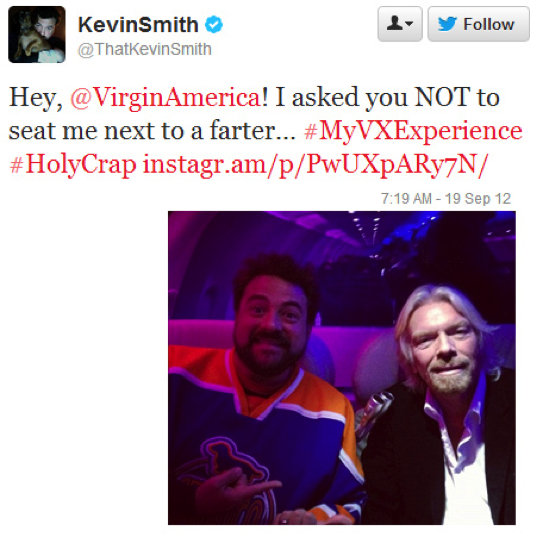 An interesting comparison is a more recent tweet from Kevin about his flight experience on Virgin Atlantic Airways, which was much more positive as he was seated next to the company’s owner, Sir Richard Branson. Given this, it is surprising that over half of consumer-facing Fortune 500 companies are not keeping up with their customers desire to use social media. They do not provide links to their Twitter or Facebook accounts on their website “Contact Us” pages. Half of these stragglers do not mention their social media presence on their website at all (source). Not only does this prevent many of the brand’s consumers from interacting the way many want to, but it also portrays the brand as being behind the times, something that can be quite harmful for brands targeting younger demographics. In fact, 15% of 16-24 year old customers prefer social media over any other channel for customer service (source). USAA, a bank primarily servicing members of the US Armed Forces and their families, is known for delivering the highest levels of customer support, earning them many awards (source). In 2009, USAA started monitoring customer messages on social media sites: “As you’re listening, you don’t want to be a stalker and observer on the web — you want to be jumping into those conversations, particularly as it pertains to reputation management or improving the customer experience,” USAA’s VP of Member Communications, Rhonda Crawford said. Even with USAA’s reputation for customer service, members still take to social media channels as a last resort. “It’s a complaint that comes through a megaphone,” Crawford observed. “When people are tweeting every half hour about a problem they had at the call center, you want to jump on that quickly and resolve the situation.” Crawford also explained USAA’s policy to take social media conversations to a different medium when private details like a customer’s member number are required. There is encouraging news that companies see the need to move into social media as a customer support channel. In fact, 80% of companies were planning on utilizing social media as part of their customer service strategy by the end of 2012; something they know is important as 62% of their customers are already there (source). While companies are moving to this space, that does not mean they know how to approach the problem. Here are my recommendations on how to proceed. In most sports, the faster an athlete executes plays, the better the results. The same applies to monitoring for issues online. If an employee can quickly address a problem, they can prevent the complaint from becoming a public relations disaster. Rather than waiting to build the brand’s overall comprehensive social media strategy, the contact center team should create a Twitter handle and target a few of their contact center agents to handle contacts, preferably those that are already engaged in social media themselves. If no such agents are available, consider targeting tech-savvy agents, most likely from a younger demographic, who will be able to quickly grasp social media concepts. 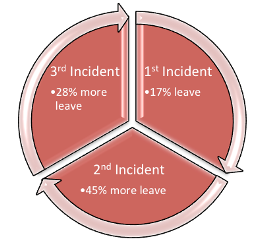 An escalation plan is also important, as customers can be unpredictable, in particular after a poor experience. Agents should not be afraid to pull in more experienced personnel to assist. However, one caveat to “going with speed” is being prepared. Bradley Leimer of Mechanics Bank stresses banks should not set up a presence on a social media site unless they are equipped to deal with customer expectations in that medium. “Once you’re on a platform, you’ve got to be ready to go (source: Crosman, P. (2010, July). Social Butterflies. Bank Systems & Technology , pp. 33-34. ).” A study by A.T. Kearney found that in 2011, 56% of the top fifty brands didn’t respond to a single comment on their Facebook pages. 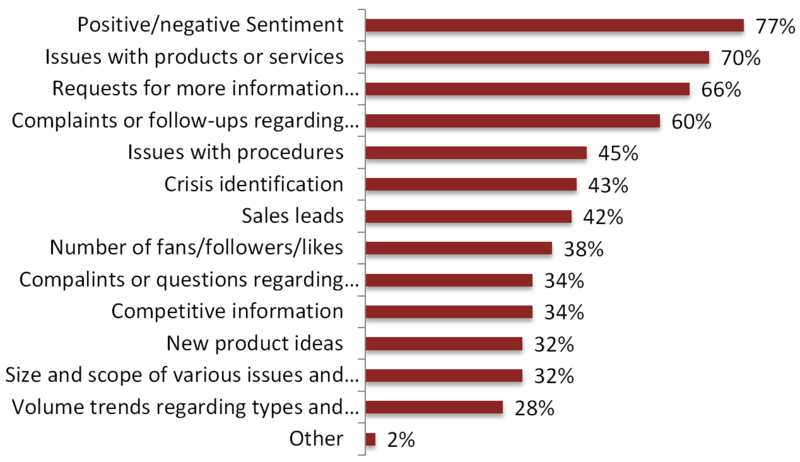 On Twitter, brands ignored 71% of customer complaints (source). Simply being a user of social media does not qualify someone to manage a company’s social media program any more than a driver of a car is qualified to lead the release of a new car platform. A proven Social Media Manager will have a track record of not only creating professional Facebook pages, but also coordinating engaging programs that increase the number of online followers, turning many of those followers into champions of the brand. This role not only coordinates social media activities between the marketing and support departments, but also provides guidance and process to teams on how best to perform their function in the new channels. While Facebook and Twitter are the clear heavy-hitters of the industry, an experienced professional will know which other channels to pursue depending on market requirements (LinkedIn, Google+, Pintrest, YouTube, blogging, etc.). With this broad knowledge base, a Social Media Manager can develop a strategy for how to manage the overall brand(s) of the company in this new marketing channel. A comprehensive strategy should start with the company’s purpose for using social media: a mission statement that serves as the commander’s intent for all involved in social media on behalf of the company. Whenever an employee or hired agent acts on behalf of the brand, they should understand not only the tactical purpose of their efforts, but also the company strategy. While understanding that a blog post can convey needed information, understanding the larger intent is vital. For instance, a goal that their blog should drive traffic to the website from users who would not typically interact with the brand, would guide the author to include keywords and links to mentioned topics, thus increasing the odds that the blog post will be picked up by as many people as possible. The social media strategy would outline what sites to be used, which tools will manage content and how analytics will be collected, reported, and then actioned. A good strategy is based on researching which networks customers use and find the best match to reach the customers effectively. It is important to evaluate the context of a brand mention and decide if it warrants a response. A one off complaint about the temperature in a company’s retail store does not deserve a response. However, a negative review of the company by an analyst or a legitimate complaint from a customer should be addressed as quickly as possible and within the same channel (Twitter, Facebook, etc.). “Generally the best practice is to acknowledge the issue on social media, but to move attempts to resolve the issue offline,” said Gartner’s Carol Rozwell (source). Determining the right hours of operation is important as well. A small Mom-and-Pop-Shop may only need to staff their presence during normal business hours, but larger companies like an airline, need to staff their social media desk 24×7 because social media users expect real-time response rates. If the group handling “mentions” on social media cannot handle all relevant comments in a timely first-come-first-serve fashion, then they should consider prioritizing them. Given the cost to the business of customer churn, one approach to prioritizing is to determine if the user is an existing customer and focus on her. Another approach is to use the person’s social influence to determine whom to respond to first. One such rating service is Klout which measures a user’s network reach and their ability to leverage it on platforms such as Twitter, Facebook, Pintrest, WordPress, and many more. Many social media tools, such as HootSuite, enable the employee to see a user’s Klout score as part of the tweet and filter and sort tweets using this as criteria. Such an approach would have helped when Jayne Gorman, a travel writer who was struggling with a British Airways online reservation. She was unable to reach the company via telephone, so she reached out to them on Twitter. BA could have done a better job at identifying Jayne early on as an online influencer. With over 5,000 followers on Twitter and a Klout score of 63, they should have prioritized the handling of her tweet. 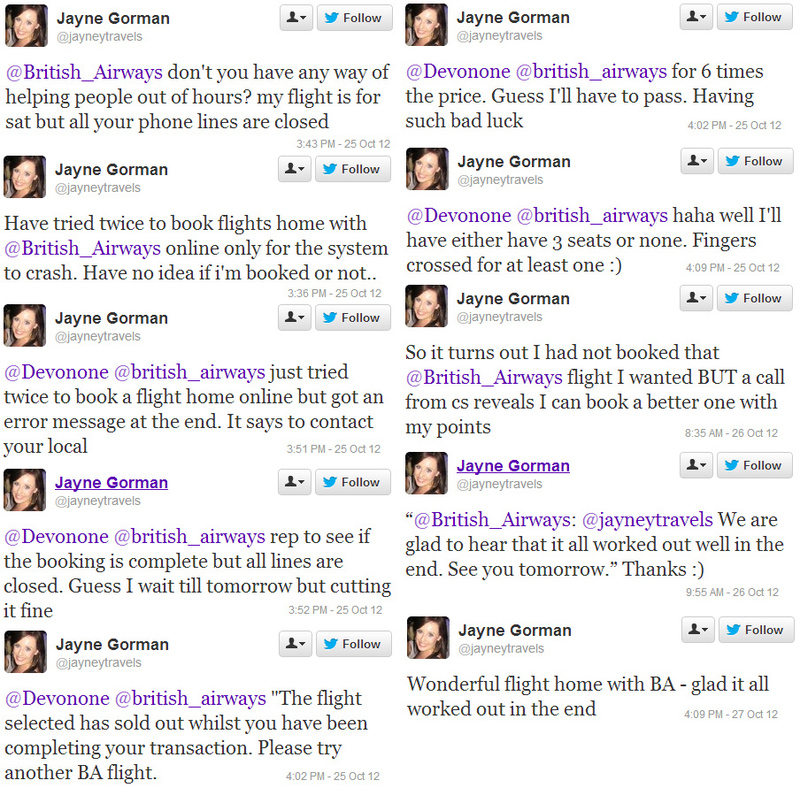 Instead, BA took thirteen hours to respond, leading Jayne to write an article on the experience for The Huffington Post. You don’t need to necessarily resolve an issue the way the customer wants it resolved, but what you cannot do is ignore them. The days of treating social media independently from a company’s operations are gone. It needs to be integrated into most, if not all business functions. Some organizations just getting started in social media have implemented the first stages of a social media engagement process, only to make the mistake of treating engagements as ad hoc. These interactions can be much more effective if you are able to match the online user to a customer in your customer relationship management (CRM) tool. In the previously mentioned DMG study, while 63% of respondents were using social media to provide customer support, only 37% were using a contact center approach. The consequence of not integrating social media with a contact center means that the company experiences missed gains in productivity and customer satisfaction. Without contact-center functionality, the team responsible for monitoring and responding to social media will need to have the skills necessary for supporting customers. Contact center applications provide a work assignment engine, making sure each item is assigned to one and only one employee, helping to determine average response times. “It’s important not only to keep records of individual conversations, but constantly to analyze the interactions to see what insights can be gleaned from them,” said Gartner’s Ms. Rozwell (source). What tools to use will vary depending on what CRM and contact center tools may already be deployed in the enterprise and the size of the brand. As companies get started, especially smaller organizations, the default Twitter interface may be a starting point, but users will quickly need at least a product like Hootsuite to provide more control. While more than half of monitored brands still use these off-the-shelf tools (source), they provide limited ownership and reporting. Avaya’s Social Media Manager is an example of suite that provides more advanced tools. 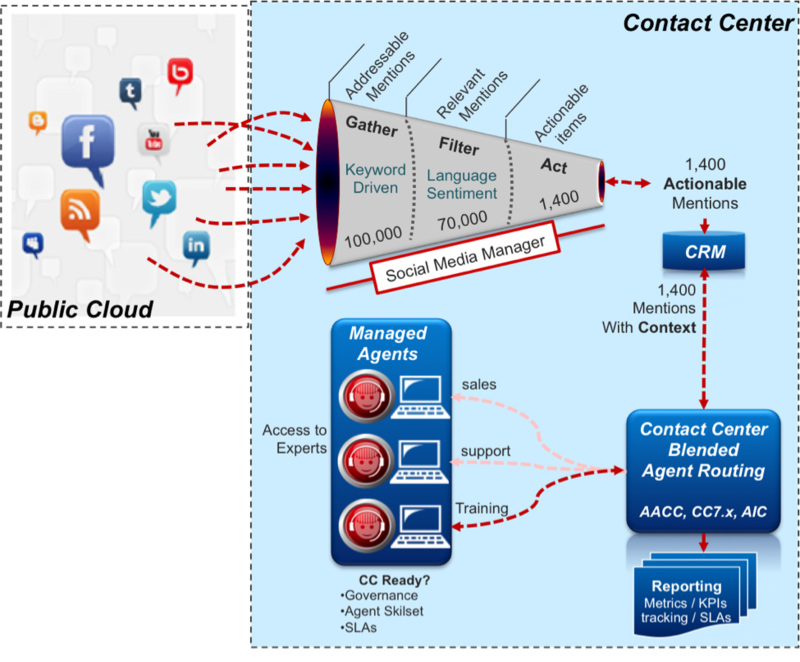 It acts as an analytical funnel for all the potential mentions of a brand online and then feeds the actionable items to contact center agents through its integration with Avaya’s Interaction Center or Aura Contact Center applications. A key component of this product is its ability to consume social media mentions, determine which are actually relevant to the brand since approximately 30% are usually spam, and then determine which of those are actionable. Rich LeGrand of Avaya estimates that of 100,000 hits in a social media search, less than 2% are actionable by the brand. Having a tool that narrows down the actions from 100,000 to only 1,400 can clearly reduce the cost to monitor these channels. The tool can be expanded to integrate with an existing CRM database, linking actionable items to real customer information. This tool also provides real-time and historical reporting capabilities, allowing both the contact center and the Social Media Manager to know exactly what is going on and how to handle it. Users of social media are not just there to complain. They have joined these networks in order to socialize with other people. To help build relationships and loyalty for a company’s brand on social media, the online presence must be humanized as well. A call center agent who is used to running through a structured script will need to be trained to properly represent the brand. These individuals need to balance making the experience both an enjoyable experience for them and the customer, while also keeping within the branding guidelines. 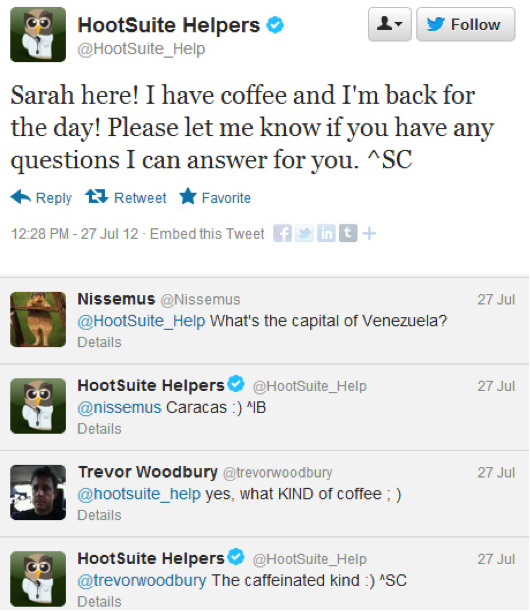 One company that does this well is HootSuite, a maker of social media tools. They tweet “shift changes” of who is responsible for their Twitter account. The individuals are encouraged to introduce themselves and have a little fun. “If your customers have an emotional attachment to your products, make sure your social media agents have that same passion. Even in 140 characters, it shows” – Jeffrey Cohen (source). After a company’s social media presence is established and processes are in place and have been shown to work, some companies choose to create multiple Twitter handles and Facebook pages for different parts of the business if the social media load increases. Research shows that in 2012, 35% of brands use more than one Twitter account, up from 7% in 2011 (source). The most common split is to give customer support their own presence, allowing users the ability to self-segment the types of interactions they want to have with the company. Such segmentation may also occur if the company lacks proper social media coordination and a business function wants to operate independently. You should be communicating to your followers your new support offerings, not just responses to complaints. Expose your personality and your value. It is important for users to know where to turn if they have a problem, and it helps establish the brand as one that takes care of its customers. For example, if a customer tweets about how wonderful support is, retweeting that to the company’s followers not only markets your support, but also further strengthens the emotional bond between that customer and the brand. The proactive use of social media by marketing departments has increased dramatically over the last decade. The danger is that its use may leave people too dependent on using technology tospeak, not allowing enough time to listen to customers. Social media is a key part of most companies’ strategy going forward, but it should not be the lynch pin. So, what will the future bring? As available tools improve, further online channels can be monitored to provide brands with more information about what users are saying about them. For example, when a software developer runs into an apparent bug with Microsoft software, they do not typically call up Microsoft for support. Instead, they search for others who have reported the same symptom and hopefully there is a documented solution. These are often found in blogs and online forums. While one of those discussion boards may be Microsoft’s, there are countless other sites that contain that data. If Microsoft could crawl those sites, identify that a user found a potential bug, and then route that action to an employee to investigate and fix, they could improve their software quality. Consumer-focused products could take a similar approach with online retailers like Amazon, pulling product feedback either into the support team or to the marketing team for future action. As social media technologies continue to grow in use and reach, companies must consider their integration and how they impact their brand(s). This is no longer the exclusive realm of the marketing department. Customer service teams must play an active role in monitoring the brand’s online presence. In order to get the most value and scale out of these activities, the effort should be integrated with CRM and contact center technologies, delivering the right contact, to the right employee with the right context. Solid execution of this approach will allow for quick and effective responses to negative brand impressions, not only allowing for image control, but also converting brand detractors into promoters.